I think this is some sort of lawsuit brought against the estate of Mary Cook Donaldson. It mentions all the children of her husband Thomas and their spouses. UPDATE 12/23/2016……I don’t think this is a lawsuit per se. I think that Edmund Ware somehow became executor of administrator of Mary Donaldson’s estate when she died. At the bottom it says “Sale or division of Real Estate of Mary Donaldson, deceased”. I think this was a matter of ” who gets what item from her estate”. The last 2 weeks have been very difficult for me research wise….I have hit a brick wall with the Donaldsons and Cooks. I feel like all this information is a wall in front of me but I can’t glean new anything from it. It is just the same information leading me in the same circles over and over again. I have looked up most of the neighbors to both Thomas Donaldson and Cornelius Cook and run into dead ends. I did find that Ruth Crump of Abbeville/ Laurens married into the Reeves family. Thomas Donaldson’s first wife was supposedly a Janet Reeves. The Crump family was associated with both Thomas Donaldson and Cornelius Cook through estate records and land deeds with Cornelius Cook. Last night I decided to go through the message boards for Laurens and Abbeville on Ancestry.com. I paid close to attention to all the names that I recognized from my research. I think I may have found the father of Thornton Davis but I am not totally sure. Thornton Davis was the husband of Sallie Cook Donaldson, eldest daughter of Thomas and Mary. He is also a legatee in Thomas Donaldson’s estate record. I am interested in finding out more about Thornton. I am still waiting for Maryland Genealogical Society to email me about my Thomas Donaldson inquiry. It has been 7 weeks and patience is running thin. Author samanthanifongPosted on February 11, 2016 February 11, 2016 Categories UncategorizedTags Ruth Crump, Thornton DavisLeave a comment on Ran into a brickwall…. I have a friend who found some information through the Maryland Archives about a Thomas Donaldson in Maryland. There were actually 2 Thomas Donaldsons. There was a Thomas Donaldson who came to Maryland in 1716 as a Jacobite prisoner from England. The Thomas Donaldson I am interested in served as a private in the 3rd Maryland during the Revolutionary War. He was in Worchester County which is on the eastern shore of Maryland. Also in his regiment was a Jesse Gray, William Davis, John Donaldson and Samuel Donaldson. There was a Jesse Gray and William Davis in Abbeville, South Carolina in 1787. In my great grandmother’s letter, she said that Thomas was a private in the Continental Army. She said that he was from Wilmington, NC. Worchester County is on the coast of Maryland. Both cities start with “W” and are on the coast. There a several similarities between the letter and the muster roll but no conclusive evidence. I will have to see what information the Maryland Genealogical Society finds for me. Author samanthanifongPosted on January 30, 2016 Categories UncategorizedTags Jesse Gray, Maryland, Thomas Donaldson, William DavisLeave a comment on Oh, Maryland…. Author samanthanifongPosted on January 28, 2016 Categories UncategorizedLeave a comment on Connections…. I sit here trying to get inspiration to write something genealogically important. My inspiration today is the soundtrack from the 1992 movie “Last of the Mohicans”. I used to listen to this soundtrack while writing history papers in college. It seemed to make the process go by faster. Little did I know the music that I listened to was of Scot Irish origin, the same as my ancestors…..haunted memory coming back I guess. I am still waiting for the Maryland Genealogical Society to email me their findings on Thomas Donaldson. Regardless of them finding anything or not, I will have an answer. That means looking at other possibilities if he wasn’t in Maryland…..New York, Pennsylvania, Charleston, the old family lore favorite Wilmington….possibilities of arrival or actual birth location for this man called Thomas Donaldson. Meanwhile, I head back to Abbeville via Ancestry.com and cruise around. I found several important wills- James Kinman died 1816, Thomas Kinman died 1822, Benjamin Mattison died 1830. James Kinman was Cornelius Cook Jr’s father in law. Thomas Kinman was Cornelius Cook Jr’s brother in law. Benjamin Mattison was someone Thomas Donaldson knew. All 3 wills had the same names on them….one community of neighbors. They formed business alliances through farming and marriage. They formed friendships. I am finding that several families on these wills immigrated from the same place in Virginia to the South Carolina backcountry in the 1790’s. Families and friends would often immigrate to new places together as opportunities and open land presented themselves. There was also incentive to travel as a large group for safety reasons. Many people traveled the Great Wagon Road from Virginia to South Carolina and onward west to Georgia as lands became available. I already know some of my ancestors…..Peirson, Hoke, Furman….traveled the Great Wagon Road south to North Carolina and South Carolina.I am hoping that the Donaldson and Cooks did as well. Author samanthanifongPosted on January 28, 2016 January 28, 2016 Categories UncategorizedTags Benjamin Mattison, Cornelius Cook Jr, Furman, Hoke, James Kinman, Peirson, Thomas Donaldson, Thomas Kinman1 Comment on Connections…. I am waiting to here back from the Maryland Genealogical Society. I made a request for them to find my ancestor Thomas Donaldson born 1750 for me. I want to know if he was in Port Tobacco with the Maddox family before the families were in Abbeville together in the 1790s. I wrote the MGS on December 22. It takes 6-8 weeks for them to respond. I sit here and wait. I found out that Nimrod Donaldson built a coffin to house the body of David Cowen. He was paid $15 to build the coffin which was a good amount of money in the 1800s. There was a James Donaldson who lived in Charleston in the 1790s who built coffins. 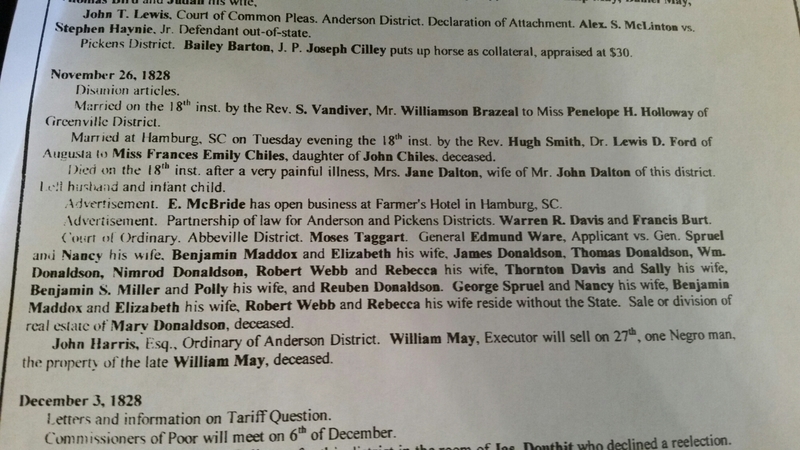 I wonder if Nimrod and the James Donaldson from Charleston were relatives? I have to research further. Author samanthanifongPosted on January 25, 2016 Categories UncategorizedLeave a comment on Waiting….. Author samanthanifongPosted on January 13, 2016 January 13, 2016 Categories UncategorizedTags Estate RecordsLeave a comment on Wills and Estate Records….